The mild steel double door wall mounted enclosure range, MAD, is ideal for installation in confined spaces where a single door, when opened, would take up too much space in front of the enclosure. The doors' loading capacity also increases as it is divided over two doors. With a IP 55 protection degree, components inside the enclosure are well protected and makes it well suited for many different applications. Body: 1.5 mm mild steel. Gland plate: 1.4 mm mild steel. Door: 2 mm mild steel Mounting plate: 2 mm galvanized steel / 2.5 mm MAD1001030R5 and above. Surface mounted with 130° opening. Concealed removable hinges with captive pin. Inner M6 welded studs to mount door profiles MMDP. Two removable mounting profiles in the right hand door. Sealing is ensured by an injected one piece polyurethane gasket. Customized lock with double-bit for easy opening of the door. Double-bit 3 mm insert and 90° movement. Espagnolette three point locking. Other inserts are available as an accessory. IP 55 | TYPE 12, 13 | IK 10. For outdoor installation, the use of a rain hood ARF and 100% polyester paint coating is recommended. The corrosion resistance must be taken into consideration. Enclosure with doors, and two door mounting profiles on the right door. Gland plate(s) with gasket(s), metallic double-bit 3 mm key, and mounting accessories. Earthing facilities. 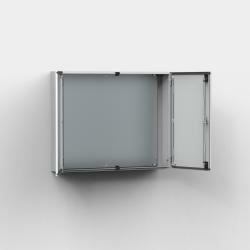 Mild steel double door wall mounted enclosure, with a IP 55 protection degree. Large enclosures can be installed in areas where there is limited access space. The enclosure's doors can support heavy loads, such as, cooling units, due to its increased loading capability. This would provide space for the enclosure door's to support heavier components or equipment such as a cooling unit. Component failure and unnecessary downtime is avoided as water and dust are prevented from entering the enclosure. The protection degree of double door enclosures is reduced from IP 66 to 55.